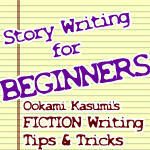 Are you starting a story? Do you have an incomplete, flawed, or no character at all? It's happened to me many times and in my struggles to perfect my creations, I have learned a few things. I present you with seven easy steps with a challenge each to get you thinking. When creating a character, you must first establish a past. Even a person with amnesia has a past, they just don't remember it. Pasts are important, they show what shaped the person and why they are the way they are today. If your character has a scar, why? If they have amnesia, why? If they have a phobia of water, why? Remember one thing: there is always a reason. Challenge: Write a brief story (vignette) of your character's past to familiarize yourself with the way things were. You may have a certain idea, a vague idea, or no idea at all as to how your character will look. First, think of their past. Having survived their past, how do they look? If they were rich and enjoyed it, would they be on the chubby side? Some important things to consider when thinking of appearance: eye color, skin color, hair color/hair type (long and full of body, etc. ), height, weight, scars or flaws in skin (missing limbs, etc. ), amount of muscle, emotions most conveyed in face (haunted, cheerful, etc. ), distinguishing markings (tattoos, brandings, etc. ), and whatever else you feel is important. Whether or not you're good at drawing, it's a good idea to try to draw your character at least once to establish familiarity and finalize their design in your head. Challenge: Draw your character now or write a detailed description from the point of view a stranger off the street. Now we move on to relationships. Relationships are vital; they tie in with a character's past, their present, and their future. You'll want to know who your character's mother, father, extended family, friends, boy/girlfriend(s), and enemies are. If your character's parents are MIA, do they have foster parents? Do they live in an orphanage? Are they old enough to live alone? How do these relationships affect your character? Challenge: Write a vignette with your character interacting with their enemy and closest friend at the same time to distinguish how they feel for each other. 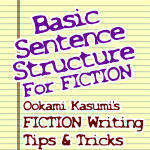 Powers apply to nonfiction or realistic-fiction characters as well as fictional. Nonfiction or Realistic-Fiction Characters: These characters powers would be talents. Are they really smart? Can they run faster than most? Make sure you establish the most important powers. There is always a reason they have these "powers." Fictional Characters: These characters may have more interesting powers such as super-strength, telekinesis, ect. The difference with these powers is there isn't always a reason they have them, though it tends make more sense if there was. A note on fictional powers: Like people, no interesting powers are perfect. You always hear the stories of the genie that turned someone into a frog because they wanted to jump high. Powers with no limit that can easily be mastered are no fun to read about or watch. Make it part of the journey to harness the magic, or if they already have before the story starts somehow show that even the most experienced handler can have troubles. Even quarterbacks have their bad season. Challenge: If you have a non- or realistic-fiction character, research how they may have obtained such talents. Was it through intensive training or does it run in the family? If you have fictional characters, find a way around the power (like resisting the Force from Star Wars) and file it away for later when your story needs spicing up. Now that all the past and omnipresent facts are established, you need to know how the present situation (your story) is affecting your character depending on their personality (which should have been developed along the first three steps). This is the easiest and hardest step so far. Put your character in a situation and watch how they handle it. If someone attacks them, what will they do? The outcome reflects your characters present personality. Also, you want to note your character's current age.
") and let fly. Surprising things can happen if they play their roles correctly. Characters must be believable. I need to emphasize the must. All people have a weakness, whether it be a fear of heights or a limp. As your character is a believable person, they will need a weakness. It can be big or small, noticeable or inconspicuous; there can even be more than one. Some examples include: Superman and his weakness to kryptonite, Iron Man and his weakness to electro-magnetic pulses. But a character doesn't just need a weakness to a physical object; they can also be guilt-ridden or insecure. Any negative human emotion can do it. In the protagonist (good guy or hero) the reader/viewer will tend to look for a bit of themselves in the character and they often tend to keep reading/watching if they do. For them, to see someone they can sympathize with go through a journey and defeat the villain is proof they could do it too. Everyone likes encouragement. I can never tell someone how to make a character perfect, it takes days of hard work and lots of vignettes to shave your character down to size. If you've been organized you may have written your characters info in a notebook or word processor document while reading this, good job! Believe it or not, a name is one of the last things you give a character. When naming, keep in mind the origins of your character. If their parents were Mexican, would they have a Spanish name? Most names also have meanings. If you already have a name in mind, go check the meaning. Sometimes it just feels right to give a character a name with a definition that seems right. I recommend behindthename.com for your most reliable naming source. One last touch before you can continue perfecting your character: decide whether they are going to be static or dynamic. Static means the character does not change as a person (personality). Dynamic means they do change as a person. Challenge: Research three possible names now. -To use this guide, there is no need to do the Steps in order. Your fresh-baked character will come out all the same if you name them first, and give them a weakness last. 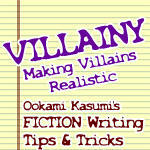 - For a main character, you normally want to create someone the readers will be sympathetic with. It doesn't usually do to have the viewers booing the hero. - For an antagonist (bad guy) you generally want to make a despicable person if they're static, or someone that the readers could sympathize with if they are dynamic for the better (turn good or find peace). - (Most) characters are human, humans act human. Observe some people (without being creepy) and just see how they act and interact. 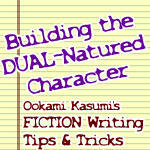 - There is a distinct difference between nonfiction and fantastical characters. With this guide, you can profile (or organize the facts) a nonfiction character, you're not really creating them. When profiling a nonfiction character, the author may hold little to no creative liberty over them, while with a fictional character there is literally a blank page to fill. Make sure to stick to facts when profiling a nonfiction character. - Be aware of "May-Sue's" and "Gary-Stu's," the faulty-beyond-reason characters. There is no set definition for these characters, but they are often "perfect," ask any writer, read a story some have shown a Sue or Stu to star in, and you'll know what they are. 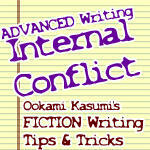 - If your character has a favorite weapon, make sure to include that in your notes too. 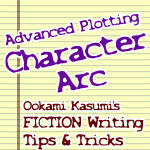 You now have a bit more than a basic outline of your character! 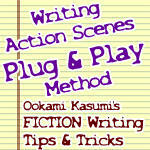 Go on and write your screenplay, script, short story, or novel! There's nothing quite like completing a riveting story. Good luck! 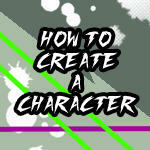 A quick guide on how to make a character. Please note I'm not a professional and this is more of a cookie-cutter for a character, it's really what you write in the end that makes them uniqe. Good luck everyone! I hope this was useful! Recently created a companion piece here. Also, a lovely meme based on this guide. 2-21-11 Thank you Turbulence1973 for reminding me to add the weakness guide! 2-22-11 Added challenges and revised. this could help me with my Ivan ...... i was going to start with his birth and end with his resurrection, but postponed it cause i'm not sure how in depth it should be, how many details and such. how can i make a character ?? how to create characters ??? This will help me make my fictional character ivan be more realistic? Looks super useful, thanks !! I feel so determined to create a really good character right now. When You're given a name, it most likely has nothing to do with who you are because you're parents name you before you even develop a personality, so technically it would make a more realistic story to use a name without looking up the meaning, unless you want to seem like a cheesy author. other than that, this is a really good guide. "Observe some people (without being creepy)"
Aww man, that's no fun! This is extremely useful! I wish I had this, like, five years ago. I love the challenges in particular - it's one thing to say what your character's past is, or what their personality is like, and another to actually apply that. I ended up learning a lot more about a character I've had for nearly six years that I thought I knew so well through them alone. Beautifully written, and definitely a deserving Daily Deviation. Thank you so much! This helps a lot! Thanks and the Daily Deviation was totally deserved! I'm just creating characters for a novel I am writing and this has helped so much. I found a couple of the tips and challenges extremely interesting. For example, giving a personality and seeing how they act it out, and the appearance from a person on the street. Both so simple but really helpful - thank you! And of course everyone loves inspiring quotes. You've been featured in #Beta-Readers' very first Resource Feature. Thank you for the wonderful resource! I would say this is very helpful for all of us here that want to start writing, but the true challenge seems to lie with just having a knowledge of things and a broadened vocabulary to be able to explain what image we're trying to portray in our stories. Of course. Writing is an art, developed by each individual's hand. We may be taught the structure of words and grammar, but no one can teach us how to inject spirit into our craft. That is something we must learn for ourselves. ... People are recommending me... *mindblown* I'm still not over getting a Daily Deviation! And that's exciting! I'll have to check that out! I try. Thanks for commenting! The wonders will never sees.... Master Writer, I applaud you for the brilliant things you do. Thanks! And thanks for the 's too! Wow, this was really helpful! Knowing Your CharacterIn a storywhether it be told on stage, on screen, or in printknowing your main characters inside and out helps create a well rounded and interesting plot. It also makes writing them easier too. In this guide, a companion to To Create a Character, I'll attempt to help put skin and flesh on the bare bones of a character, to create "character," and to discover things about them that youthe creatornever knew. One of my favorite ways to get to know my character is to interview them as one would a celebrity. The interview can be general, just asking about their life, likes, pet peeves, etc. or it can be prior to or after a significant event (i.e. just saved the world, just won the World Cup, recently defeated by protagonist, etc.). - Do you have any pet peeves? I Wish You Enough Recently I overheard a Father and daughter in their last moments together at the airport. They had announced the departure. Standing near the security gate, they hugged and the Father said, "I love you, and I wish you enough." The daughter replied, "Dad, our life together has been more than enough. Your love is all I ever needed. I wish you enough, too, Dad." They kissed and the daughter left. The Father walked over to the window where I was seated. Standing there I could see he wanted and needed to cry. I tried not to intrude on his privacy, but he welcomed me in by asking, "Did you ever say good-bye to someone knowing it would be forever?" I Don't UnderstandThe thing is, I don't understand. I know I'm different, until now I embraced my uniqueness. When you laughed, I assumed it was a joke. The thing is, I don't understand. I never knew you were mocking me. But I never knew it was at me. But I just thought I was oversensitive. Feelings I wasn't aware I had been hiding. 50 PercentDupe burst into the dark room, memory sticks in hand. He and Gem had made it through the Scorpia defenses, but they had split ways a hallway back. Gem wanted to take out some main security systems and distract the adversary, he had insisted that Dupe continue on and download the Intel. Spinning abruptly as the sounds of shouting guards reached his ears; Dupe slammed the metal door shut and shoved a workbench across the entryway. No one would be entering on his watch, Dupe just hoped Gem didn't have to get in any time soon. As the sounds of guards recededthey obviously dismissing the main computer server roomDupe turned to assess his findings. He had followed the memorized map to the letter, and if his memory served him correctly, this was where he would find the information MI6 so desperately wanted. Why would they come, she thought, I never did anything but drag them down. And in her last moments of life, all she could think about were the things she had left undone, and how she had utterly failed. Finally, after what seemed like an eternity, the pain faded, and she fell into a deep, dark, suffocating abyss. Firestorm LogicMarriage is a funny thing. I have never known the marriage that is fantasized by every couple. For me, marriage has always been an agreement between two individuals to live under a single roof. One complains, one takes it lying down; they both fight like mortal enemies. Wedding photos make me sick. I see a couple, a smiling, laughing couple who cannot wait to share each other's lives. Their only thought is of the love for their partner. That soft, downy feeling, burning hot on occasion, that will never leave. Marriage has always been conflict, violent like a firestorm, burning deeper than any flame. Both of them try to outdo the other. "I take the kids everywhere. I do all the cleaning. I make the most money. I get no appreciation." Someone is always in the wrong. Trapped in between, children are forced to choose sides. There is constantly hypocrisy, blame. Friday the Thirteenth - Ch One Lush green woodland surrounded him on all sides, positively teeming with life. Ants marched unceasingly in an orderly line through the underbrush like a tiny army journeying grimly to the battlefield. Deer and elk flitted between tree and brush, only seen at the edge of his eyesight. Terry's ears seemed to be ringing, he couldn't have possibly heard right. He blinked once, briefly concealing doe brown eyes, and then stuck a finger in his ear, twisting it to clear wax. "I'm sorry," he apologized, "could you repeat that?" Broken Promise"Promise me, Alex. Swear on Ian's grave that you'll return. You'll come home." Jack Starbright was normally the very image of optimism. Her fiery red curls often framed her round, boyish face, lips curled in a genuine smile that could be a beacon in even the darkest night. Bright colors surrounded this woman and she strived to see the best in everyone. The latter had become increasingly hard. She held his gaze, daring him to make the vow she'd set. No small amount of sadness and defeat were evident in his unnaturally steady eyes. It was with tentative pity he spoke. "I'll promise. Just for you, Jack, I'll promise." Alex turned for the door. A cab idled outside the house, average to any onlooker but those who knew the truth beneath the façade. The windows were bulletproof, the outside armored, the driver an agent. "But I can't be sure to keep it," he muttered, just loud enough for her to hear, "I'm a chronic liar." Dream of FreedomWhat do we all have in common? What is mutual to all? What is a part of everyone? And our Dream of Freedom. I want to write a story. I have a couple of ideas, but no idea what to do with them, or even how to begin! Help?! So when you wanna write a story, where do you begin? With your PASSION! What do you KNOW, really? What do you love to Do, to Study, to Think About, to Talk About...? Whether it's cave-diving, model trains, skate-boarding, sewing, horses, mythology, ghost legends, or particle physics your passion is where you will find your most unique and powerful work. Make a list of all the things you know well and all the things you've done -- seriously! Mythology, history, any retail jobs you might have had -- anything you might have seen, done, or studied. Sticking with your passions and your personal experiences also helps you make fewer MISTAKES. The flash of pain exploded in my cheek from the slap her hand lashed out at me. If you were watching this scene as a movie, that sentence is NOT how you would have seen it happen. 1) Her hand lashed out at me in a slap. I've created characters. Lots of characters. To be frank, my first ones sucked. I eventually got better. I wouldn't call myself a definitive authority on creating characters, but I would prefer to let you learn from my mistakes so you don't have to learn from your own as much later. How to Introduce a CharacterThe classical Movie Introduction  Sometimes, you get a hero. Not over time, but right at the start  this is your hero. He's confident, he's suave, and he always packs his shaving cream. Somehow he always manages to get that beard just right, despite the fact that you've never seen him trim. Everything about him is admirable, and you just wanna follow him like a little puppy dog because that's how AWESOME he is. it might work, but you still shouldn't do it. It's one thing for movies, where you can simply follow someone's action across the screens. In books, you want the closeness that only seeing the character fall on their face time times just to get it right once will bring. 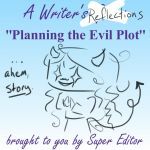 The stumbling introduction - sometimes, your character stumbles into the wrong thing at the wrong time. Or the right thing at the right time, perhaps, but  if you want a good story  you should probably make sure it ends up worse for them than it would have otherwise. The Static Trait is the small personal HABIT an individual character displays which reveals their personal Neurosis, their driving NEED, especially in stressful situations. This habitual or even ritual behavior acts as both their greatest source of trouble and the linchpin to their success. It's the individual character's "Accident Waiting to Happen". 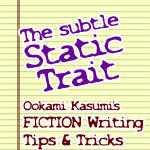 The most obvious place to find visible Static Traits is in both Comedies and Tragedies. These stories (and movies) RELY on their characters' Static Traits to linchpin the plot. > Adversary  The one causing all the trouble. > Proponent  The one trying to keep things the way they are. > Ally  The close companion of one or the other caught in the middle. In other words, you can tell any story with ONLY these Three Characters; perhaps not with any real detail, but you could still do the entire basic plotline. > MOTIVE - Driven by a REASON to Make something happen, such as Revenge. > ACTION - Driven by the need to ACT, normally because if they don't they die, but an incentive such as a Reward or Prize works too. The classical random (there's always a classic. ): This is the sort you see in just about any old RPG, or RPG comic, and probably most current ones as well  that person or thing you randomly meet so you can be sent off in a random direction and never have to meet them again. get around it wherever possible. One thing I saw in the Wheel of Time books (by Robert Jordan) was having the rumors and such be heard OFFSCREEN, and delivered to the characters by someone they know. You still get your information, but without the useless extra faces. The only real reason to put in someone random is for some bit of symbolism, as a general rule, so unless you wanna get real deep  or are prepared for your readers wondering if the old farmer is actually a reference to an ancient Norse God  you might wanna avoid the classics. Alright, you've got your hero, your villain, your damsel maybe even a style of transformation and a monster too. Wanna know what comes next? No idea, yet! You should have figured out your companion aaaaaaages ago. There's very little that's more important than a good companion. Whether it's to lend support or kick them down, no hero can do it alone. Even if they really wish they could. 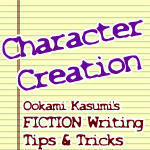 To Create a CharacterAre you starting a story? Do you have an incomplete, flawed, or no character at all? It's happened to me many times and in my struggles to perfect my creations, I have learned a few things. I present you with seven easy steps with a challenge each to get you thinking.